Federal law says officials can't use public office to benefit family members. Environmental Protection Agency Administrator Scott Pruitt said that he and his wife "love Chick-fil-A" a day after a report he asked an EPA aide to set up a meeting with the company to discuss a possible franchise for his wife. Federal law says that government officials can't use their public office for personal gain or to benefit family members. If Pruitt told his aides to do personal favors for him or his family on government time it could be a violation of federal law. Pruitt did not address the concern that the overture, regardless of whether it was made through staff, could be an abuse of his authority when asked about it on Wednesday. But he did say he and his wife are fans of Chick-fil-A. "I think with great change comes, I think you know, opposition. There's significant changes happening not only at the EPA but across the administration and it's needed," Pruitt told a reporter from Nextstar TV in Washington D.C. "Look, My wife is an entrepreneur herself, I love, she loves, we love Chick-fil-A as a franchise of faith and it's one of the best in the country and that's something we were very excited about and we need more of them in Tulsa and we need more of them across the country. So anyway, it's an exciting time," Pruitt told a reporter from Nextstar TV in Washington D.C. Documents released recently and reviewed by ABC News show that Pruitt aides helped him look for an apartment, set up meetings about financial opportunities for his wife, and even shopped for a mattress, raising questions about whether Pruitt violated federal rules by asking his employees to do personal favors for him on the government's time. If Pruitt asked his aides to do personal favors for him or his family on government time it could be a violation of federal law. Two of Pruitt's close aides resigned this week, including one who was involved in helping him with his real estate search. Emails from one of Pruitt's former schedulers Sydney Hupp show that she reached out to officials from Chick-fil-A to schedule a meeting with Pruitt last summer. The company told The Washington Post, which first reported the emails on Tuesday, that the call was to discuss a franchise opportunity for Pruitt's wife. The emails about the meeting with Chick-fil-A were obtained by the Sierra Club through a public records request and lawsuit and were reviewed by ABC News. The Post also reported that Pruitt's wife did not complete the franchise application. Pruitt's wife, Marlyn, could not be reached for comment. A spokeswoman for Chick-fil-A confirmed to ABC News that the conversation with Pruitt was about a franchise for his wife, as originally quoted in the Washington Post, but declined to provide any additional information. The EPA did not respond to ABC News' requests for comment on the meeting. 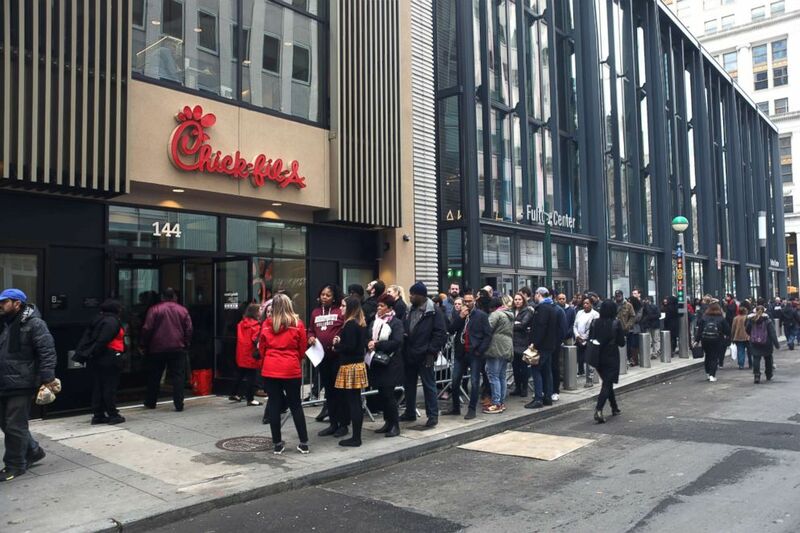 (Emilie Richardson/ABC News) A new Chick-fil-A opened on Fulton Street in New York, March 30, 2018. A search of business records in Oklahoma and Kentucky did not show any businesses registered under Marlyn Pruitt's name, or under her maiden name, in the last 15 years. Pruitt's financial disclosure filed with the Office of Government Ethics in December 2016 listed no assets or income from his wife's employment. An Oklahoma state financial disclosure form from 2015, while Pruitt was the state attorney general, also does not list any contracts or financial interests in connection with his wife. Marlyn Pruitt could not immediately be reached for comment. It's unclear if she was involved in any other businesses that would not be listed by the secretary of states' offices. The White House and President Donald Trump did not address Pruitt's inquiring about the franchise Wednesday, but the president said the EPA 'is doing really well' in a meeting at FEMA headquarters. "Administrator Scott Pruitt, thank you. EPA is doing really well. You know, somebody has to say that about you a little bit, you know that Scott, but I tell you the EPA is doing so well," Trump said a briefing about the current hurricane season at FEMA headquarters on Wednesday. White House press secretary Sarah Sanders said Tuesday she hadn't spoken to President Trump about the Washington Post story but said "we continue to have concerns" and would look into the report. Democrats on the House Oversight Committee also released a letter on Monday showing that another of Pruitt's schedulers, Millan Hupp, Sydney Hupp’s sister, helped him find a new apartment and even contacted the Trump International Hotel in Washington, D.C., about purchasing a mattress for Pruitt. Millan Hupp confirmed in transcribed testimony that she helped Pruitt during her personal time, but emails released by the Democrats show that she emailed a realtor on Pruitt's behalf during the workday on at least one occasion and using her EPA email address. When asked about Millan Hupp's real estate search Pruitt also previously said that it was done during personal time and that she was a family friend. Millan and Sydney Hupp both received significant pay raises approved by Pruitt's chief of staff, according to documents released by the EPA's inspector general. Sydney Hupp left the agency last year and ABC News has confirmed that Millan Hupp and another aide who received a raise, Sarah Greenwald, both resigned from the agency this week. Pruitt said in a statement Wednesday that Millan Hupp served an "integral role" in the EPA team from day one. "I’ve had the opportunity to know Millan for the last several years as a colleague, friend and trusted partner. She has done outstanding work in all of her endeavors here and will be sorely missed. I wish her all the best," he said. The EPA inspector general is already looking into the use of subordinates’ time at the agency, as well as other ethical questions including salary increases for aides, reassignment of staff who raised questions about spending and Pruitt's living arrangement in a Capitol Hill townhouse connected to lobbyists. Inquiries into the cost of Pruitt's security detail and travel are expected to be completed later this summer. A spokesman for the nonprofit watchdog group Citizens for Responsibility and Ethics in Washington said it’s hard to imagine any other EPA administrator keeping the job with this many ethical issues. "There are a number of issues here but they all stem back to the same general problem which is misuse of office and misuse of government resources. So he should not be using his official position to try to get benefits for him or his immediate family," CREW spokesman Jordan Libowitz said. Sierra Club Director Michael Brune also said the move was a "disgraceful new low" for Pruitt. "This is the clearest example yet of Pruitt unethically and illegally seeking personal benefits because of the job Donald Trump has entrusted him with. How much longer will Trump allow Pruitt to enrich himself at the taxpayer’s expense? This appears to be the only Administration in history that would allow this level of corruption to thrive, as any President with any sense of ethics or the law would fire Pruitt immediately,” Brune said in a statement. Editor's note: This story has been updated to include information from a Chick-fil-A spokesperson.